Our kitchen was feeling a little empty since I sold our Restoration Hardware Toledo stools. I loved the look of those stools, but I didn't like the squeakiness and found them a bit hard to move around. To replace them, I bought 4 green/oak stools off of kijiji for $10 each. After a bit of sanding, painting, taping and sealing, I had the perfect set of metallic paint dipped stools to go with my stainless steel appliances. The hardest part was taping off the base and legs to make sure the metallic spray didn't end up on my freshly painted legs. I found the solution was cling wrap and painters tape. 1. Wooden stools, the cheapy ones found at target or walmart, or better yet, like I found second hand. 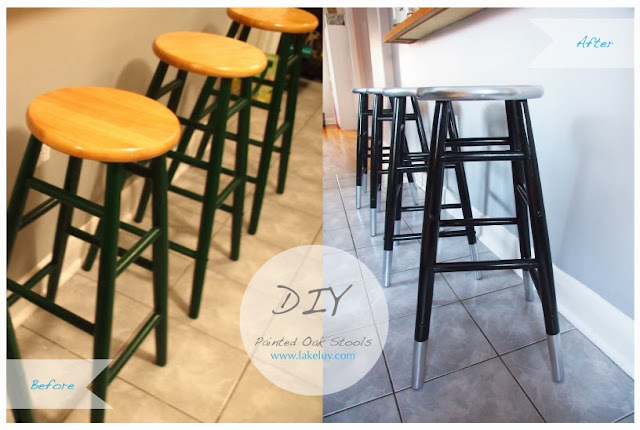 Once I sanded the stools, I painted the legs with two coats of Behr's Black paint and primer in one. Once dry, I covered the legs in cling wrap and painters tape to keep the plastic in place. I used the metallic spray paint to paint both the seat and the tips of the legs I had taped off. Taking the tape and plastic off once dry is always my favourite part. I then had the hubby apply two coats of wood sealer to the stools to keep the paint from scratching off. I am super happy with the final results! Thanks Urban Elder, I appreciate you saying so!